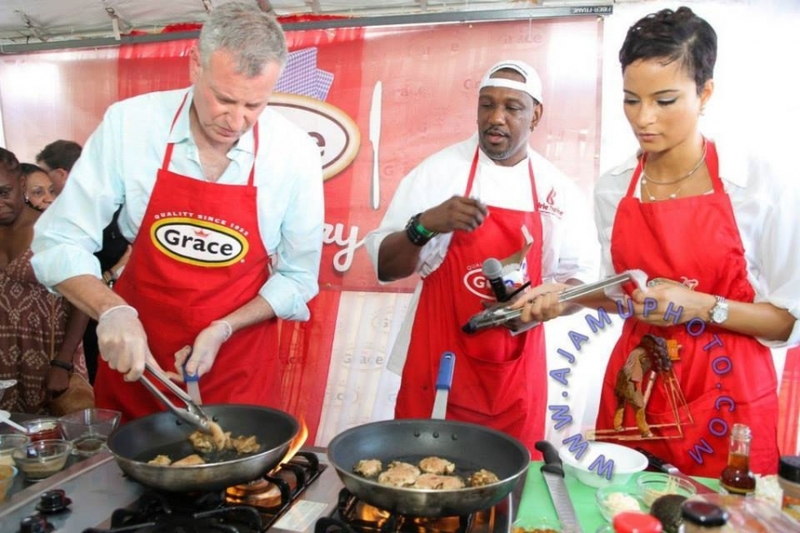 Queens, NY — The organisers of this year's Grace Jamaican Jerk Festival are excited about the brewing contest between New York's Mayor Bill de Blasio and Miss World 1993 and Member of Parliament Lisa Hanna. This year's Celebrity Quick-Fire Challenge at the 7th Annual Grace Jamaican Jerk Festival will take place on Sunday, July 23, at the Roy Wilkins Park in Queens. de Blasio has won the title twice, beating Kaci Fennell, Miss Jamaica Universe 2014, and Derrick Bannock (Leon) from the movie Cool Runnings. de Blasio has indicated that he plans to return this year to compete against Hanna. Hanna epitomises today's modern woman; an instructor with a black belt in karate, she served as the youngest member of Jamaica's Parliament in 2007 and as the country's minister of youth and culture from 2012 to 2016. She has been hailed for being a powerful advocate for disadvantaged children, creating wealth and equity to her people and spearheading a successful lobby for Jamaica's first-ever election to UNESCO's World Heritage Committee in 2015. Plus, she's known to throw down some tantalising meals when she entertains. With a résumé like that, the mayor better bring his A game to the competition when he returns as the two-time winner of the coveted Dutch Pot trophy! The Culinary Pavilion will be the centre of activities where patrons gather and rub elbows with celebrities, chefs and fellow jerk lovers. The 2017 line-up promises not to disappoint, as host, celebrity chef Hugh “Irie Spice” Sinclair, with his spicy persona, welcomes co-host Chef Wenford Patrick Simpson to the pavilion for an afternoon of culinary showmanship, spice and magnificent competition from some of NYC's finest. Cooking demos will allow guests first-hand interaction and sampling opportunities from Simpson's tasty saucepans. Simpson is the celebrity and corporate executive chef of BB King's in Times Square who is known for food combinations that are as flavourful as they are beautiful. Indeed, his culinary prowess has landed him numerous features on local and national TV and in major food publications. The live Q & A session will give patrons the chance to engage him in conversation about his culinary process. Returning to the pavilion is celebrity chef, Andre Fowles of Miss Liiy's Kitchen and Everything Food by Andre Fowles. The two-time winner of Food Network's Chopped will delight fans when he demonstrates one of his special recipes. Also in the demo kitchen will be entrepreneur, philanthropist and former private chef to NBA All- Star Amar'e Stoudemare, Chef Max Hardy. Once you go Jerk you always come back. These two powerhouses are becoming a mainstay at the cook-off tent. They love this place! Competing for the Love of Jerk! St Lucia native Chef Shorne Benjamin will compete against Jamaican Chef Troy Levy in the epic Celebrity Chef Throw Down. Both chefs have achieved much success on the Caribbean food scene by being trailblazers in their innovative Caribbean cuisine creations. The countdown to the anticipated chef throw down starts now! Who will walk away with the coveted Dutch Pot Trophy, and bragging rights served on a platter? “There is no shortage of fun, food and excitement under the culinary pavilion. Whether you're a jerk aficionado or new to the jerk-style cooking, you're encouraged to come out to feast on the festivities, and bring your appetite,” said June Minto, managing partner, Jamaican Jerk Festival USA, Inc.
Advanced tickets to the Grace Jamaican Jerk Festival NY are available online at www.jerkfestivalNY.com or at selected retail outlets in the tri-borough area. Children 10 and under are admitted free. The 7th Annual Grace Jamaican Jerk Festival is presented by Jamaican Jerk Festival NY, LLC, in association with VP Records. Sponsors are Grace Foods, The Jamaica Tourist Board, Tower Isle Patties and VP Records.